This section provides a tutorial example on how to create a REST project to test REST Web service that has no WADL document. If you have a REST Web service that has no WADL document to provide its definitions, you can still create a REST project in SoapUI using an example of the Web service's URL. 1. Run SoapUI and click "File" > "New REST Project". You will see the "New REST Project" dialog box showing up. 2. Enter the example URL in the URI field: "http://www.herongyang.com/Service/Hello_REST.php?Message=Hello", and click "OK". You will see a new project called "REST Project 1" created. 3. Right-click on "REST Project 1" and select "Rename". Enter "HelloREST_NoWADL" as the new name. 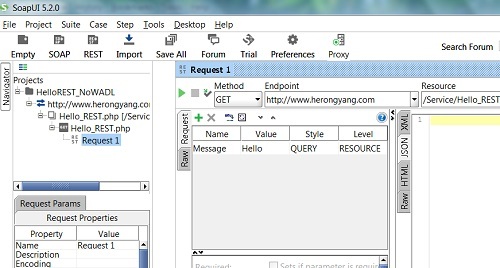 Open details of the project, you will that SoapUI created a service called "http://www.herongyang.com", a resource called "Hello_REST.php", a GET method called "Hello_REST.php", and request template called "Request 1". Very nice. I only need to change "Message" parameter value in the request template test my "Hello_REST" service.